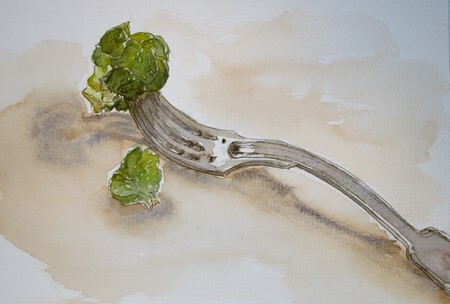 by Myfrenchkitchen.In food, home, Ink, kitchen, objects, pen, watercolour.Leave a Comment on Sprout – Ill. Fr. I chose the Brussel sprout, but now it looks more like a broccoli to me. Well, they’re both green and healthy…. Hi, welcome to the EDM! Love your drawings and paintings, they are great! Hope to see more of your work in the future! Ronell, this is absolutely stunning! I love all the work you’ve posted here, but this is my favorite. Hello, welcome to EDM. Lovely watercolors. HIya, welcome to EDM- I really like your paintings, and this sprout is my favorite 🙂 Hope to see more! Thank you for your warm welcome and the kind comments;I feel like it’s Christmas and I’m receiving one great gift after another! Wow this is such a great drawing. love the composition. The fork is just great. Fabulous and welcome! I look forward to seeing more.